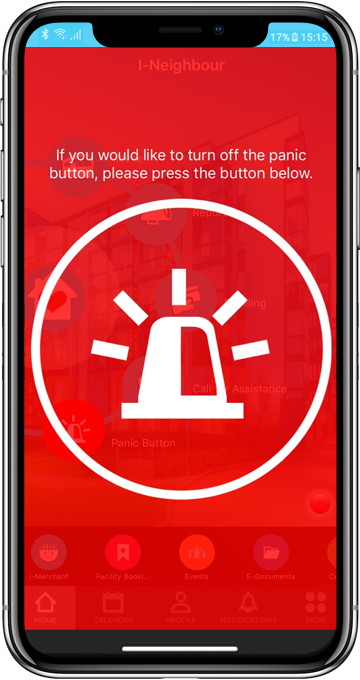 The Panic Button is a feature in i-Neighbour that is designed to ensure the safety of the residents within a neighbourhood. In the event of an emergency, residents can trigger the Panic Button in order to inform the relevant individuals of the incidents occurring. Before proceeding with the Panic Button feature, it is first recommended that residents add in the Emergency Contacts. This is to ensure that the S.O.S distress signal will be able to cover wider grounds other than just the security guards and the management. 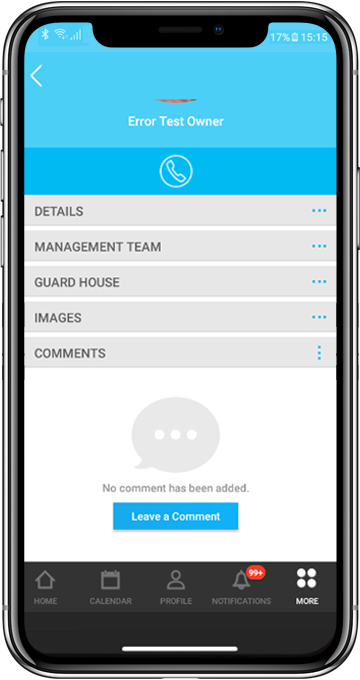 Note that you do not need to include the security guards and the management of your neighbourhood as they will be included by default, meaning they will automatically be alerted when the Panic Button is triggered. 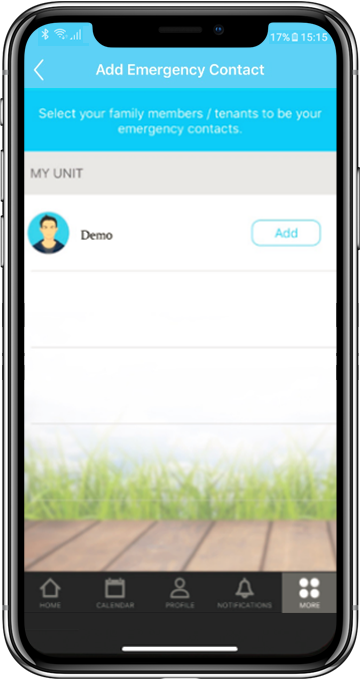 That said, to add Emergency Contacts into your i-Neighbour account, please login into i-Neighbour App > More > Emergency Contacts > ‘+’ icon to include individuals that you prefer. For adding of close friends or individuals that are not living in your neighbourhood, please proceed to click on Create New and type in their Name and Mobile No. 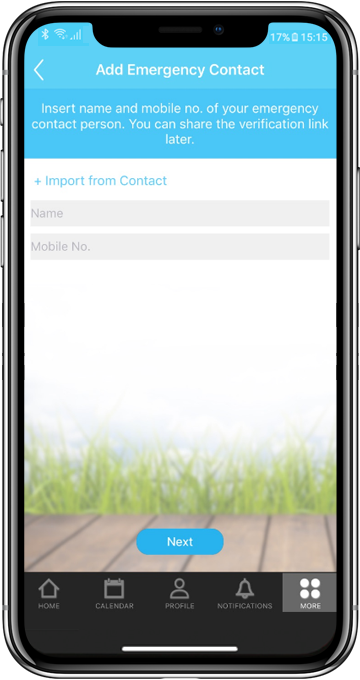 (note: you can even import the contacts from your smartphone by clicking on ‘Import from Contact’). 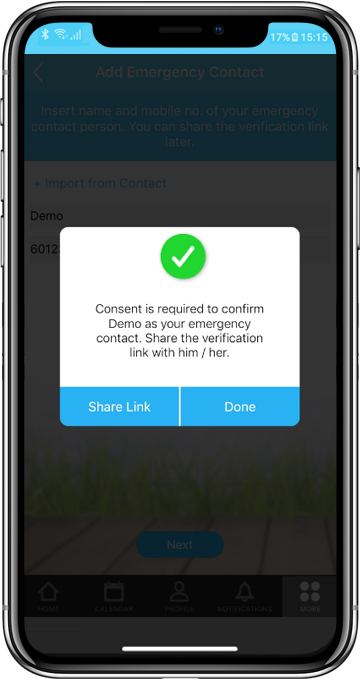 Once done, a verification link can then be sent to your added contact in order to obtain his/her consent. Please click on ‘Share Link’ to send the link to the selected individual. In the link provided, the person added can select whether he/she would like to be included as an Emergency Contact. If agreed, the individual will have to login to his/her i-Neighbour account to verify their acceptance. Otherwise, they will need to create an i-Neighbour account in order to accept the request. Once done, i-Neighbour will then display the added individual as your Emergency Contacts. 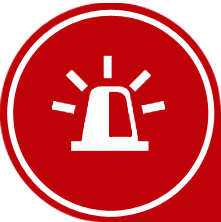 Please be informed that if the added individual declined the request, the Pending status will be removed entirely from the Emergency Contact listing and the individual will not received any notification whenever the resident trigger the Panic Button. If you have family members or tenants within the unit, you can opt for Add from My Unit (Family/Tenant) provided that you have already register and approved them into your unit beforehand. 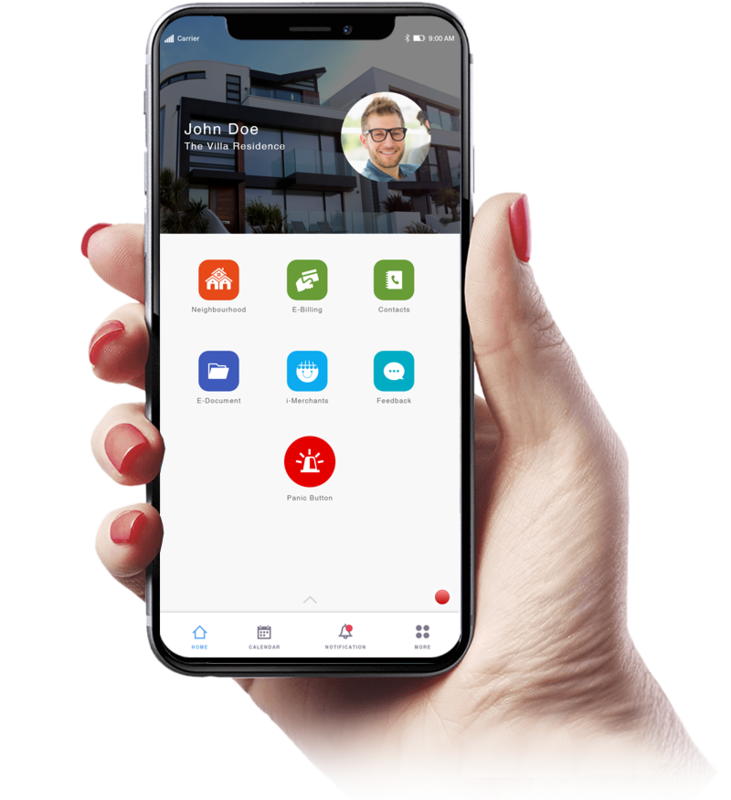 As such, just click ‘Add’ on the members/tenants that you would like to add as Emergency Contact and the selected members/tenants will be added into the Emergency Contact without further need of any approvals. Once added, your family members/tenant will then be alerted whenever you trigger the Panic Button. 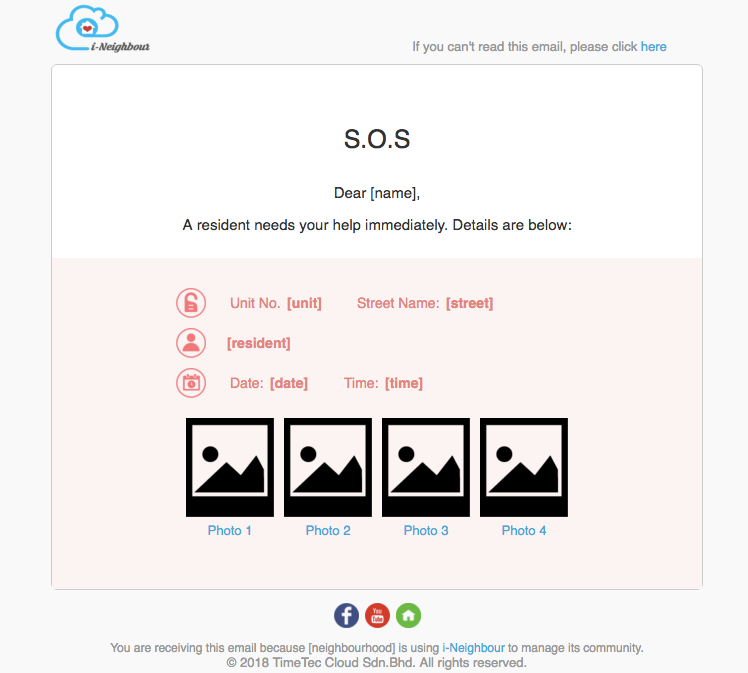 Lastly, you can also select your neighbours to be included in your Emergency Contact as well. 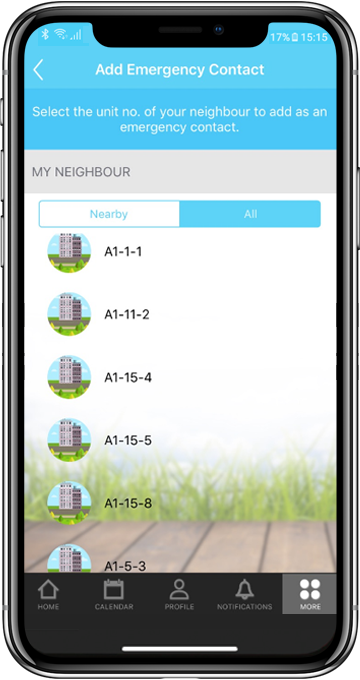 Please click on ‘Add Neighbour’ and proceed to filter the results via ‘Nearby’ or choose ‘All’ to list all units within your neighbourhood and select the unit in which your neighbour (Unit Owner) lives in. For security purposes, you are required to type in the exact name as established by the neighbour (Unit Owner) in order to send the request. Once submitted, the neighbour (Unit Owner) can select to Accept or Decline the request. When accepted, your neighbour will then be included into the Emergency Contact. 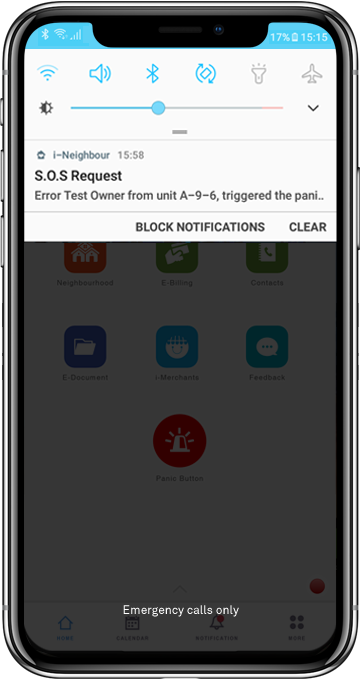 If declined, the neighbour’s Pending status within your i-Neighbour account will be removed entirely to indicate that the neighbour has rejected your request and he/she will not receive any notification whenever you trigger the Panic Button. The adding of Emergency Contact plays a crucial role in not only ensuring the effectiveness of your distress signal but also your safety too. Therefore, it is recommended that you should add in individuals that could possibly assist or reach you in times of need when triggering the Panic Button. 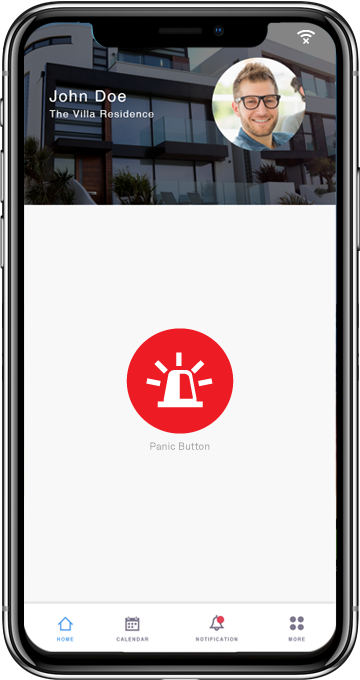 To activate the Panic Button on i-Neighbour App, users will have to tap and hold on to the Panic Button icon (3 sec) in order to start the countdown process. This is to prevent the Panic Button from being unintentionally activated. 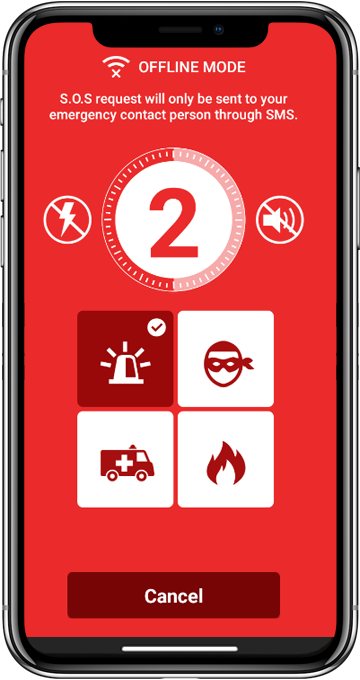 During the countdown process (3 sec), users will then be given the choice to turn on flash and sound as well as the option to specify the types of incident involved (standard, burglary, fire, medical assistance) by tapping on the respective icons. When the countdown reaches 0, the Panic Button will then activate. Once activated, flashes and sounds will be emitted from the user’s smartphone (if turned on) to gain nearby attention. Additionally, 4 photos will be taken via the user’s smartphone to be uploaded into the server for better description of the incident happening or for the sake of obtaining crucial evidences. If users decided not to upload the photos, this step can be skipped by tapping on Cancel Upload > Skip. However, if users would like to select certain photos to be uploaded, note that they will first have to tap on Cancel Upload, proceed to choose the photos and then only tap Upload. Lastly, users will be taken to a screen requesting whether the users would like to deactivate the Panic Button. 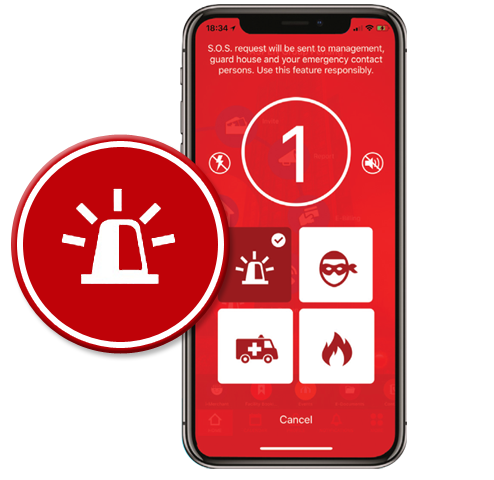 If assistance has arrived and there is no longer a need for the distress signal, users should then turn off the Panic Button by tapping on the alarm icon and confirm the action. 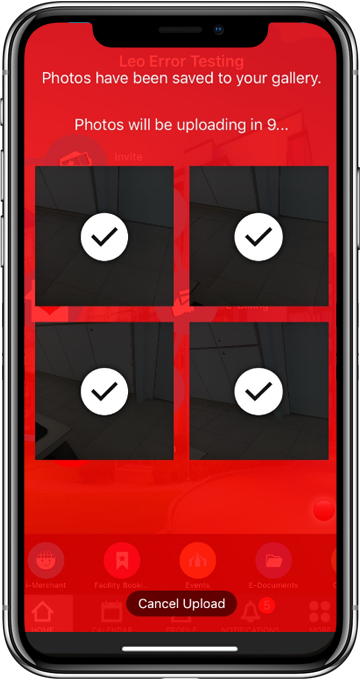 When the Panic Button is activated, security guards on duty will be alerted via the alarm sound of the i-Neighbour Guardhouse Tablet Panel and Siren Kit (if any) installed at the guardhouse until the alarm is acknowledged. 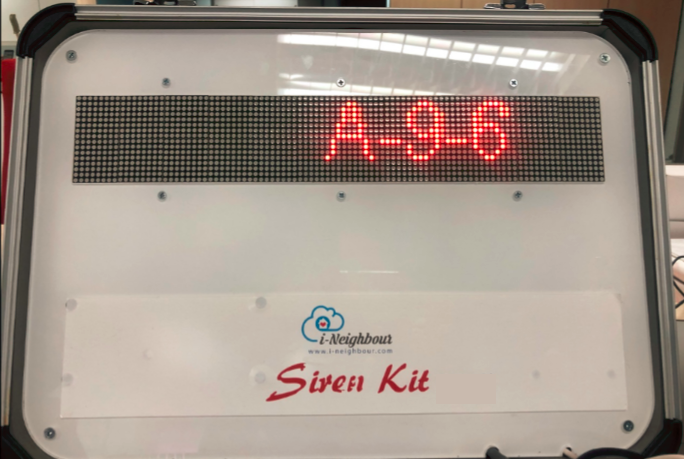 Within the Guardhouse Tablet Panel, users information such as Emergency Type, Current Location, Resident Address, Images and etc, will be listed on the Tablet Panel, while the Siren Kit will display the Resident’s Unit No. clearly on its LED panel. This is so that guards will be able to respond quickly and provide assistance to the affected individuals. 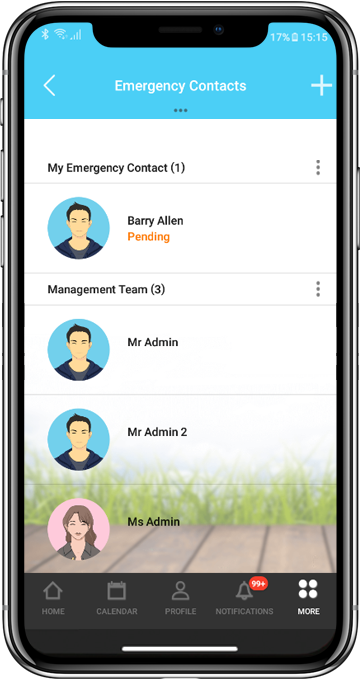 On the other hand, the management will also be receiving the alert push notification (emits sound even if the phone is in Silent Mode) via i-Neighbour App and a notification via i-Neighbour Web as well as a Panic Button Email along with the details mentioned above regarding the emergency event in order for them to act accordingly as well. If included, the resident’s Emergency Contacts will likewise receive the alert push notification (emits sound even if the phone is in Silent Mode) together with the stated details via i-Neighbour App in addition to the Panic Button Email and be promptly informed of the situation too. However in the event when there is no Internet Connection and residents trigger the Panic Button in Offline Mode, the security guards and the management of the neighbourhood will NOT receive any alert notification regarding the emergency event. In this situation, SMS notifications will instead be sent out by the residents’ smartphone and ONLY the residents’ Emergency Contacts will be notified via text messages. In terms of the Panic Button feature, there is also another setting known as the Panic Button Radius Setting (accessible to Admin only) in which the management could utilize to determine the extent of the S.O.S. distress signal. 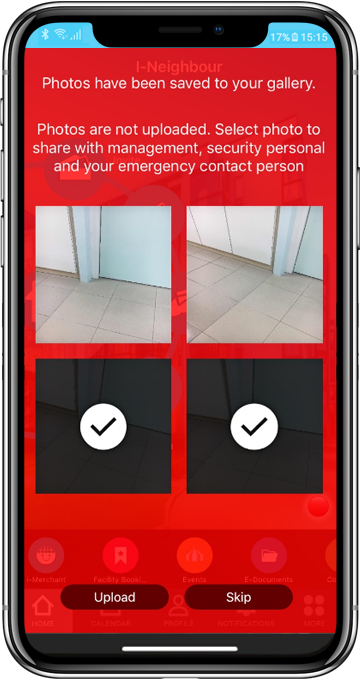 When enabled, the security guards on duty and the management will receive the Panic Button Alert only if the residents trigger it within the determined radius. Otherwise, only the resident’s Emergency Contacts will receive the notifications regarding the emergency event. For more information regarding the Panic Button Radius distance within your neighbourhood, please enquire from your neighbourhood management. All triggered Panic Button events will be placed under Emergency History for future recording and referencing purposes. Additionally, it is here whereby the individuals involved (Resident In Distress, Admins, Guards and Resident’s Emergency Contacts) can refer to and obtain the necessary information details such as Emergency Type, Current Location, Resident Address, Images and etc regarding the emergency events that have happened. What’s more, the individuals involved can also provide their comments in the Comment Section below for added clarifications. 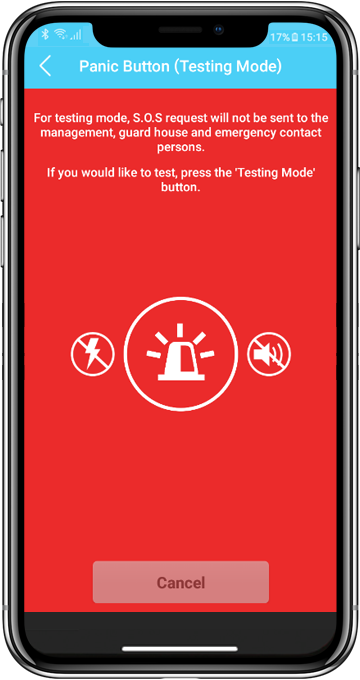 Testing Mode is a module in Panic Button that allows residents to try out the Panic Button feature without actually triggering an alarm in the neighbourhood. The process is entirely similar and this is so that residents can be familiarized with the feature at hand and know what can be done during an actual emergency. Note that pictures taken while using Testing Mode will not be uploaded into i-Neighbour server but will instead be saved into the user’s smartphone. 1. What if I quit the App while activating the Panic Button? 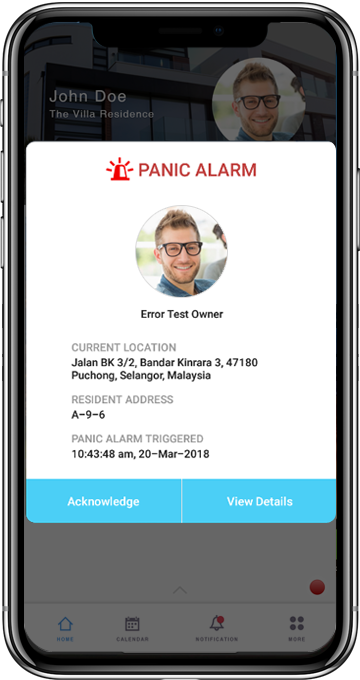 When triggering the Panic Button and the App is quit, the Panic Button will still alert the relevant individuals of the emergency involved but depending on the process, photos might not be taken or uploaded into i-Neighbour server. 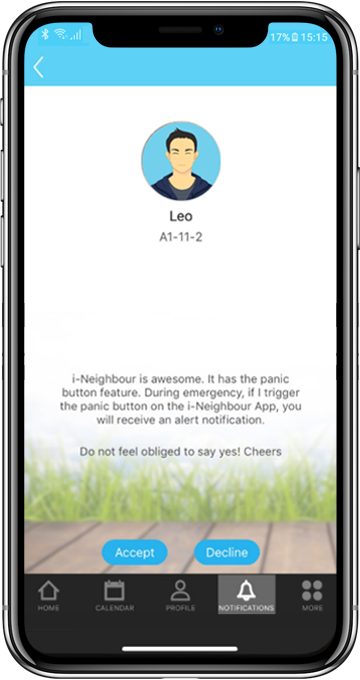 As the Panic Button is still activated, i-Neighbour App will prompt the users to switch off the Panic Button once the users return back to the App. 2. Is it necessary for me to turn on Flashes and Sounds while activating the Panic Button? Are there any differences if I don’t? No, it is not necessary to turn on Flashes and Sounds unless you wish to gather the attention of individuals nearby. There won’t be any differences in terms of the operation of the Panic Button. 3. Do I have to add the security guards or the management into my Emergency Contacts for them to be informed of my distress signal or are they already included? No, you do not need to include your security guards or management as Emergency Contacts in your i-Neighbour account as they will be included by default. 4. Will the management and guards still be informed if I trigger the Panic Button outside of the radius? Unfortunately, no. 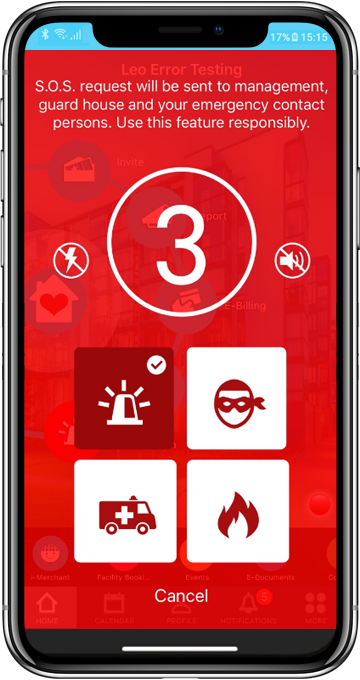 Once outside of the Panic Button Radius, the Panic Button will only alert your Emergency Contacts while the security guards and the management of your neighbourhood will not receive any records of the emergency. 5. To what extent will my Emergency Contacts be informed when I trigger the Panic Button in Offline Mode? 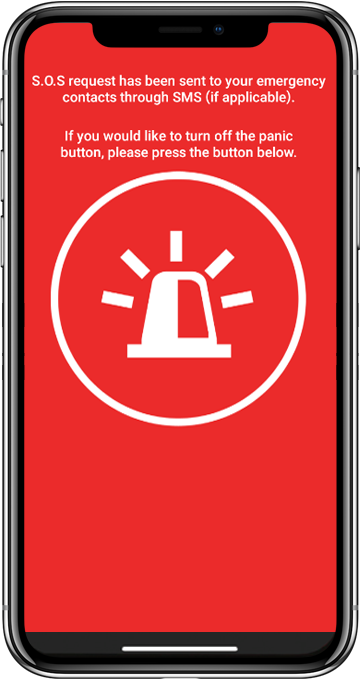 When triggering the Panic Button in Offline Mode, note that ONLY your Emergency Contacts will receive a text message informing them about the emergency triggered while the security guards and the management of your neighbourhood will not be receiving the text message. 6. Will the photos taken in the emergency event be automatically saved into my own album? Yes, photos taken while triggering the Panic Button will be saved into your own album as well as be uploaded into the i-Neighbour server. 7. If my emergency contact is still pending, will he/she be notified when I trigger the Panic Button? 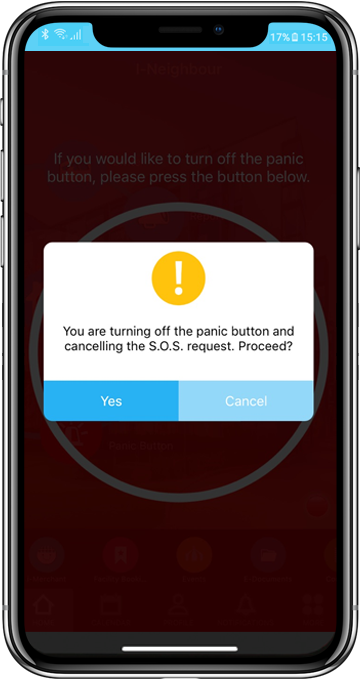 No, when added as an Emergency Contact, the user must accept the request first before he/she will be notified by the Panic Alarm feature triggered by the resident. 8. Can I removed myself from being an Emergency Contact after accepting the Emergency Contact request? No, you may not. Once accepted, you will be included as the Emergency Contact until the resident that you have accepted decided to remove you from their Emergency Contact listing. 9. Can the security guards, the management or even my Emergency Contacts turn off the alert notifications triggered by my Panic Button? No, the security guards, the management and your Emergency Contacts cannot disable the alert notification triggered by your Panic Button. 10. I have already created an i-Neighbour account while accepting my friend’s Emergency Contact request? How come I did not receive any alert notification regarding the triggered Panic Button event? 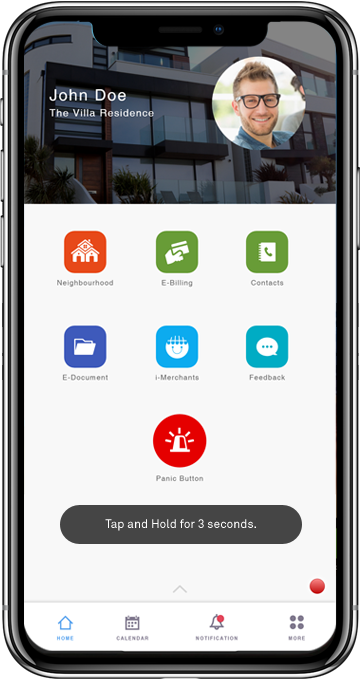 To receive alert notification from i-Neighbour after creating an account, you must first download i-Neighbour App and login to your account in order to receive the alert notification from your friend’s Panic Button event. Otherwise, you will only receive the text messages from the triggered Panic Button under Offline Mode. 11. I have a friend who is also using i-Neighbour in a different neighbourhood but I can’t seem to add him/her into my Emergency Contact when I opt for the Add Neighbour option? The Add Neighbour option only applies to individuals within the same neighbourhood as yours. 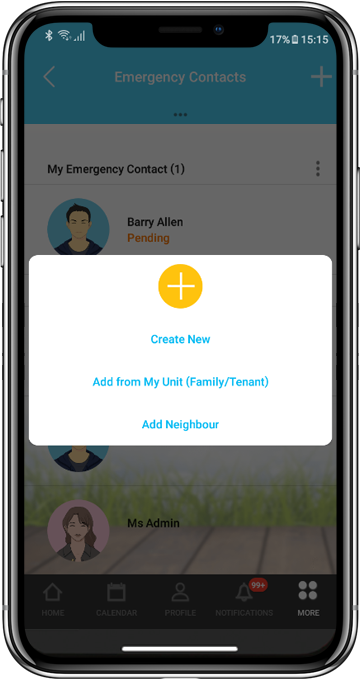 To add your friend who is also using i-Neighbour in another neighbourhood, you will need to select the Create New option in order to add your friend as Emergency Contact.